Observed in a Nairobi Garden, Kenya. March 2013. 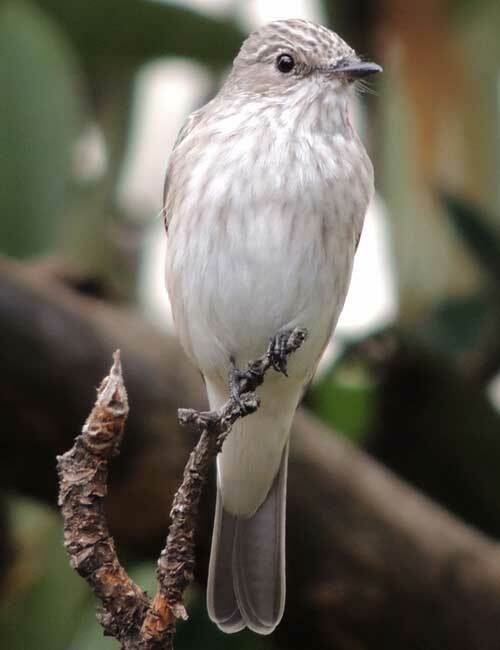 From Wikipedia: The Spotted Flycatcher is a small passerine bird in the Old World flycatcher family. It breeds in most of Europe and western Asia, and is migratory, wintering in Africa and south western Asia. It is declining in parts of its range. This is an undistinguished looking bird with long wings and tail. The adults have grey-brown upperparts and whitish underparts, with some streaking on the breast. The legs are short and black, and the bill is black and has the broad but pointed shape typical of aerial insectivores. Juveniles are browner than adults and show the spots on the upperparts which give this species its name.